Have an afternoon to kill, a night out with friends, or evening in with the family games make a great way to spend the time, and The Vault is here to help out. We've got a great selection of current and classic board games, everything you need to start up a Role-Playing campaign, get started with a new card game, or paint and play some miniature war games. All the books and supplies you'll need to get your campaign off the ground. Books, figures, dice, maps, reference cards, and helpful knowledgeable staff are here to help you whether it's your first game or you're a veteran dungeon delver. We've got what you need to turn your tabletop into a war zone. Models, paints, tools, and rule books for a variety of games and systems. If we aren't battling out in your game of choice tell us we always like adding new games and new players. Need something for your next party or family game night? Check out our selection of great games, from the quick and simple to the elaborate and strategic we'll find you a game. Want to try it out or just come to the shop and play some games? 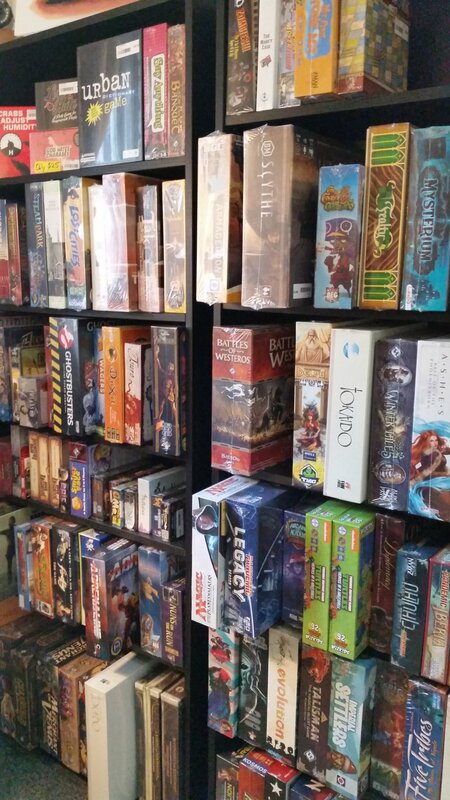 Stop in and check out our Board Game Library!